A truly authentic Belgian Tripel. "Old Drunk" is brewed for us in Belgium. Rich golden color, lots of Belgian yeast character. Very strong. A deep golden-brown over-proof tripel, the first thing this Old Drunk announces to the drinker is its abv: the strong aromas wafting aloft from the glass are redolent of rock-candy, sugared coriander, crystallized lemon-rind, and—above all else—a yeasty, winey, boozy heat. The body is similar: syrupy (and, thus, much better while it's quite cold), with a lot of the Belgian-candy notes predominating, alongside some darker sugars, the booze, and mellowed but neat oakey textures. It's strong, it's somewhat simplified, and it's unapologetically something that's true-to-name: old-tasting and efficiently drunk-making. As a result of the latter note, I'm inclined to bump the "Overall" score up a bit, as it seems Papago has hit their mark, even if I don't love that mark. Meanwhile, I bumped the "Taste" score down a smidge, because this beer—or at least the howler I filled a few days ago, but just opened—doesn't taste as good as it did five years ago when I first tried this heavy-Belgian à la fût at Papago. cool beer, not spellbinding by any stretch though, i had slightly higher hopes for this, although its pretty darn good. i can taste the sugars in this but the beer is never sweet, i like what the candy sugar does to this, and the way the wheat malt pops from it, like salt on good meat, brings out the flavors. very pale beer, hazy, and an astounding white head that wont quit. the nose is a little sweet but the flavor, especially the finish, is not. some body here, oats likely, and a mild funk to the yeast, but more white grape or apple fruitiness to it. classically belgian it feels like, and while i can smell the alcohol a little bit, its not that evident in the taste or mouthfeel. highly effervescent in feel, and drier than other tripels i have had. not a style that usually moves me, and this one didnt, but its very good beer, recommended highly for those who get into tripels enthusiastically. I'm one of the lucky few who can walk to Papago Brewing Company and pick up a growler of this. I have also had it on tap, in 12 oz bottles, and in the old cage/corked 750ml bottles. I might be a tad biased: this is my go to beer many nights to finish a good night of drinking. 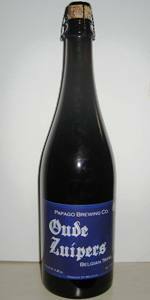 Contract brewed exclusively for Papago by Van Steenberge, I'm not sure if I call it an Arizona or a Belgian beer. Ages extremely well: should you find those older 750s for sale, buy them all and send them to me. The dustier the bottle, the better. Enough fan boi twaddle, lets talk about the beer in front of me . Appearance: clear burnt orange. Restrained head. Taste: notes of banana, pepper, clove, hot alcohol.